There are a plethora of reports available in the Statistics section of iCarol that can be used to illustrate many different facets of your service. Please see below for further information on some of the most commonly used reports. 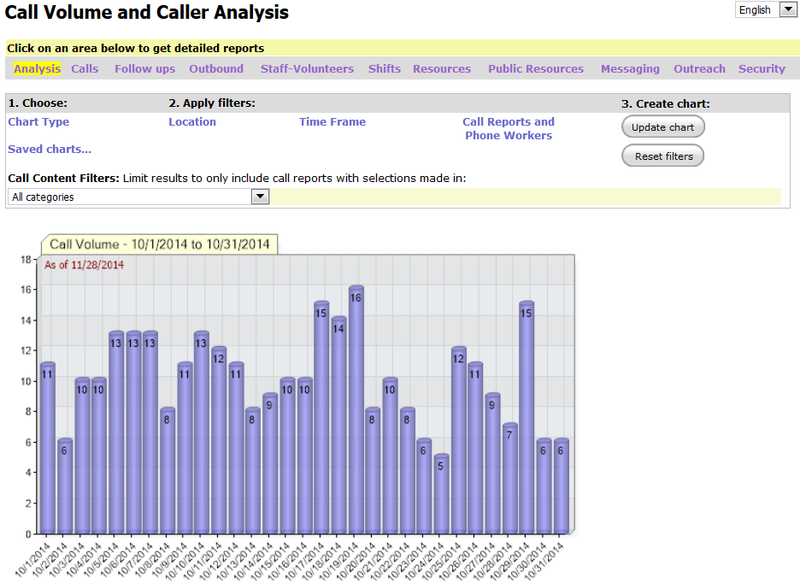 One of the most basic reports is the call volume report. 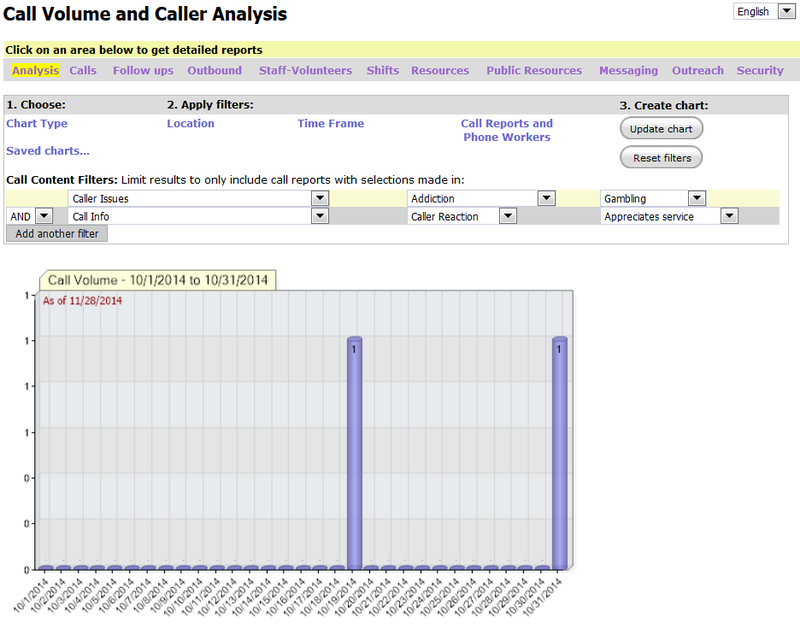 It shows how many call reports were submitted during the time frame specified. Location – If you enter a specific location or list of locations, the resulting call volume chart will just show the calls from callers located in those locations. If you have a geography based funder who is interested in how many calls you received from a specific area, this filter can assist you in creating a report for the funder. Time frame – You can enter a very specific time frame for your reports to cover, and you can also change the interval to such options as daily, monthly, hour of the day, day of the week, etc. You can also limit the report to specific days or the week or hours of the day. In this way, you could build a report that showed your call volume during business hours (9am-5pm Monday to Friday), and compare it to the call volume during non-business hours (5pm-9am Monday to Friday plus weekends). Call Reports and Phone Workers – The Phone Workers drop-down menu will list all the users in your iCarol system. In this way, you could see how many calls each user is submitting. If you use several different call reports in iCarol, you can also user this filter to run call volume reports on just one of your call reports, or any combination of them you wish. The final filter available is the Call Content Filter. This filter enables you the filter the call volume chart by any piece of data you collect in any of the custom fields on your call reports. You can add up to 5 call content filters. In the chart below, I have filtered to show calls on the topic of Gambling where the caller appreciated the service they received. Many clients have managers, board members or funders who are interested to see how many calls are being received in regards to a specific demographic or topic. A pie chart is a great way to illustrate this. 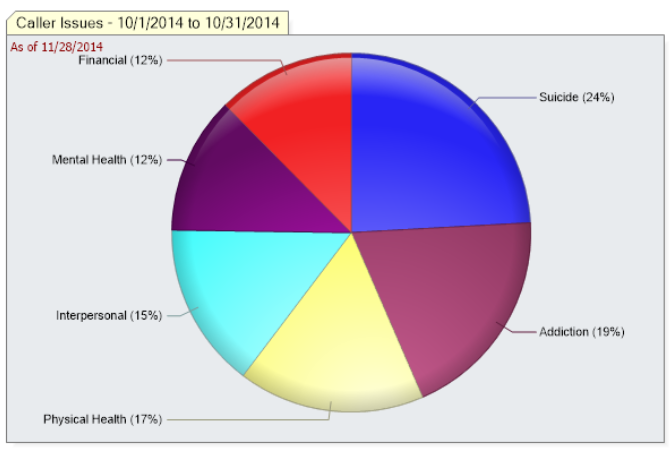 When you first select the pie chart from the Chart Type menu on the Analysis tab of Statistics, the pieces of the pie will represent the categories on your call report. You will want to “drill down” into one of the categories to get to the more specific data by clicking on a piece of the pie. 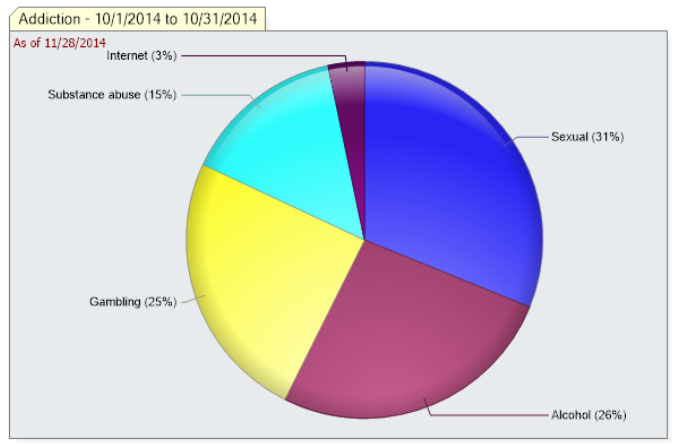 The pie chart will then show the groups in the category selected. You will want to “drill down” once more to get to the field level of your call report, where the most specific data is stored. 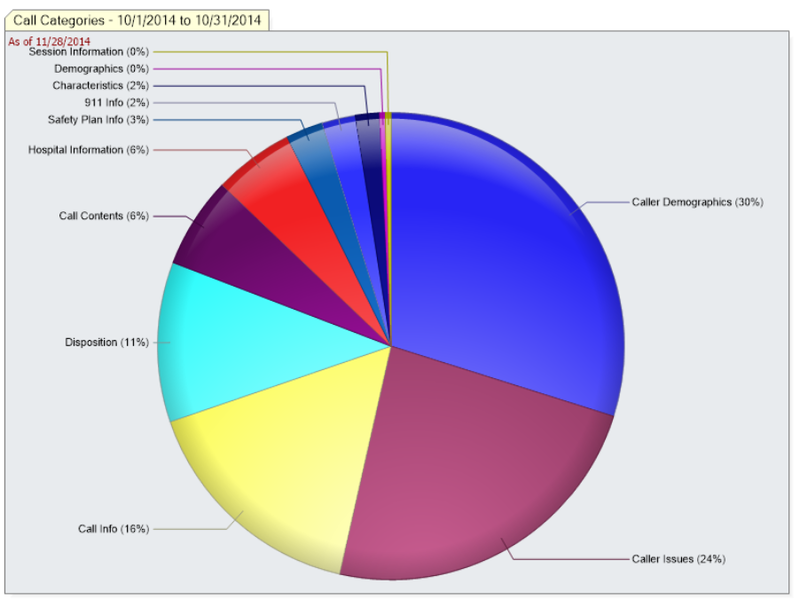 Many iCarol clients track the needs of their callers via the AIRS taxonomy. 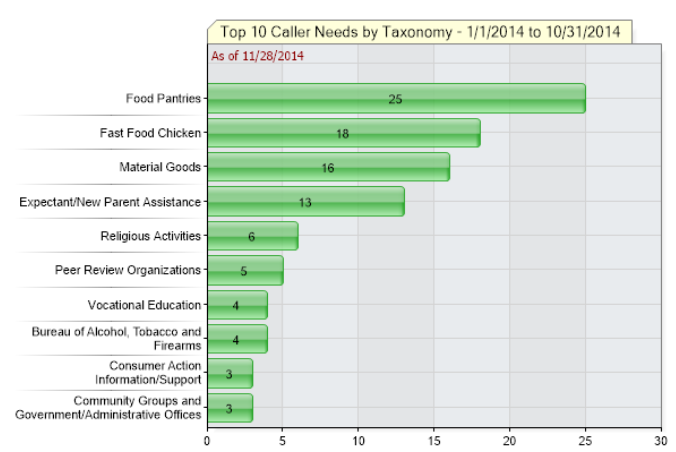 With the “Needs by Taxonomy” report, these clients can see the most common needs of their callers. This information can be used to ensure call takers are trained appropriately, that appropriate resources to fill these needs are available in the resource database, and even to inform funders and policy makers about the needs of the community. 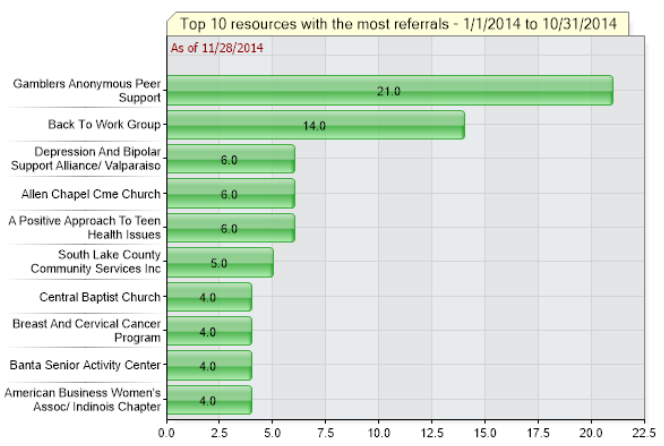 The “Count of referrals to resources” chart shows which resources have been referred to the most often. This chart is another way to illustrate the needs of the community and could even be used to illustrate the need for expanded programs and increased funding. This is only a small number of the reports available in the Statistics section of iCarol. We encourage you to explore all the reports available and view the tutorial videos on Statistics to learn more. If you have any questions about Statistics in iCarol, please feel free to contact the Support Team at any time.